The martial art naginata is named after the weapon we wield in this budo discipline : the naginata. The naginata is best described as a japanese hallberd. It is a 180 cm - 200 cm long hardwood staff with a curved single edged blade attached to it. Just like kendo, naginata is a full-contact martial art. Naginataka don't use real weapons but bamboo versions of them. 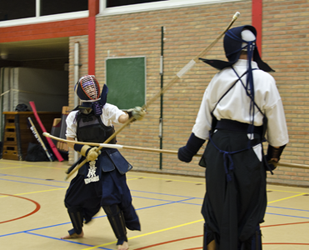 Naginata is practiced in traditional protective armor (bogu). Valid hit points in naginata are head, wrists, throat, upper body and shins. Naginataka practice to achieve unity of weapon, mind and body. This unity is necesarry to act on instinct during the fight and is acieved by practicing the different techniques over and over. 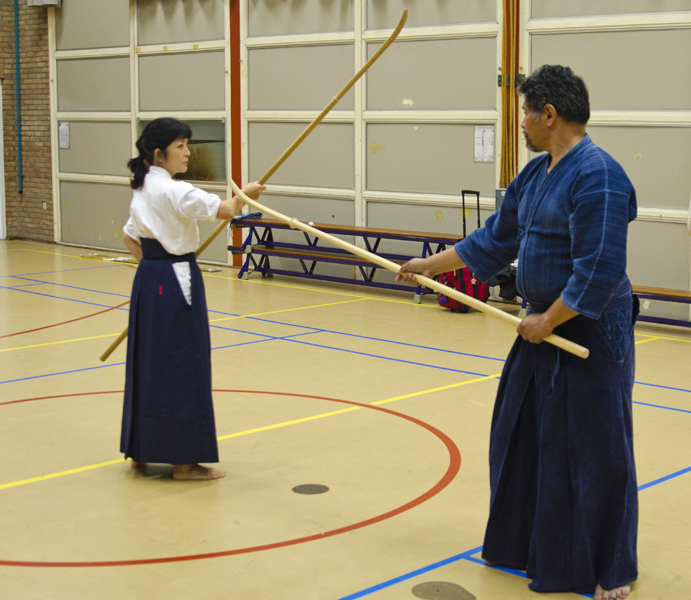 A naginata training is less intensive than a kendo training. 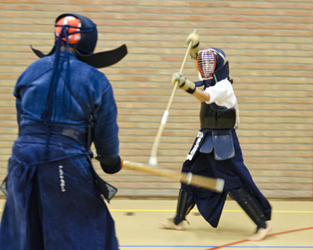 Furthermore naginata is more varied than kendo because of the many different stances and attack techniques. The naginata presumably has a chinese origin. It looks like a hallberd but just like a katana, it's a cutting weapon. It was primarily used by infantry. The earliest mention of naginata usage is in writings from the 8th century. In the 12th century the naginata's popularity grew. In that period there was an increase in cavalery usage. The naginata proved to be very suitable for eliminating a horse and it's rider. It is common to associate Naginata with women. In ancient Japan females of the samurai class where trained in naginata usage. It was seen as a suitable weapon for women as attackers could be held at a distance with it. Nowadays there are still many women who practice the martial art naginata.